The best site ever for instructions. 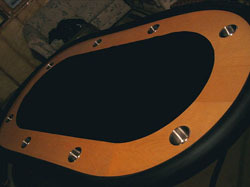 Your simple yet brilliant idea to construct a cradle for the jigsaw for perfect curves helped me a ton! Can i have all the dimension of your table ? Race track, center, mainboard and rail board. If you have plans, it will be the top. 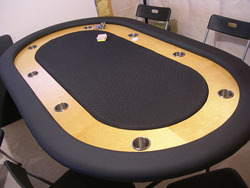 I like your poker table so much I’ve decide to make one for myself following your instruction. But i’m stuck, I’m trying to figure out the 8 cup holders placement. I cant find them on your site. Do you think you can help me. Would be greatly appreciated. Thank you. It wasn’t very scientific. Basically I placed them on the sides where I wanted them to land. Then I used a flexible tape measure to evenly place them on the arc. I’m at work so I can’t tell you what the exact measurements were, but my main goal was to get 8 seats with the same table space and look right on the table. 2 on each side and 2 on each end is how it came out. How much of the vinyl did you get for your table? I’m going to build a standard sized table. How much more do you think I’ll need for a standard sized table. Thank you very much in advance. Also, from the prices of the plywood I’m assuming that you are using 1/2″ for the four sheets? Thanks for the help. I used 3/4″ for the hardwood and 1/2″ for the rails. As for the vinyl. My table is only narrowed 2 inches now that it has the whisper rails on it so I would doubt you would need more than I bought. Awesome diagrams and plans. My only question is tthat I’m building a standard 96″ table using the full size of an 8×4 plywood. How do you go about the railing? Do you need two separate plywood and somehow connect the two or any pieces together? Help?? Thanks in advance…..
Do you have any blackjack table plans with a race track?